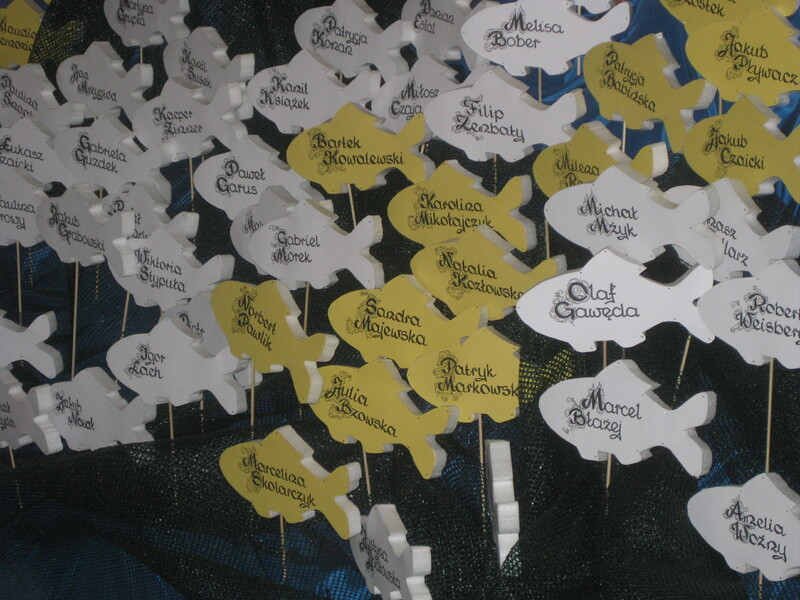 It’s an understatement to say that the people of Poland – and especially the people of Blessed Pope John Paul II’s hometown of Wadowice – love their Polish pope. 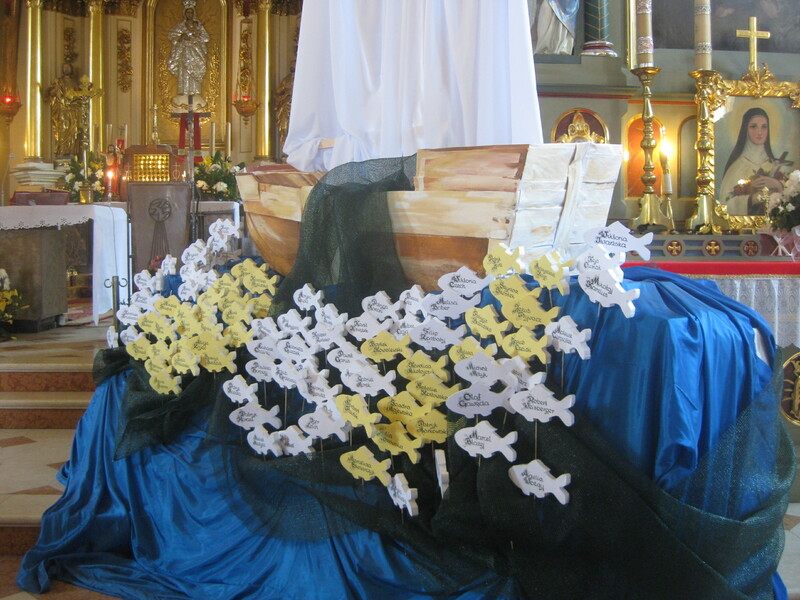 Check out this video report on how the late pope’s home parish expresses that love. ZAKOPANE, Poland – Even on a dreary, rain-filled day, few vistas are as spectacular as the Tatra Mountains in Southern Poland. A 26-member Baltimore pilgrimage group, led by Bishop Mitchell T. Rozanski, made it to one of the mountain peaks via a cable car May 28 – catching glimpses of the snow-dotted terrain through raindrops and fog. 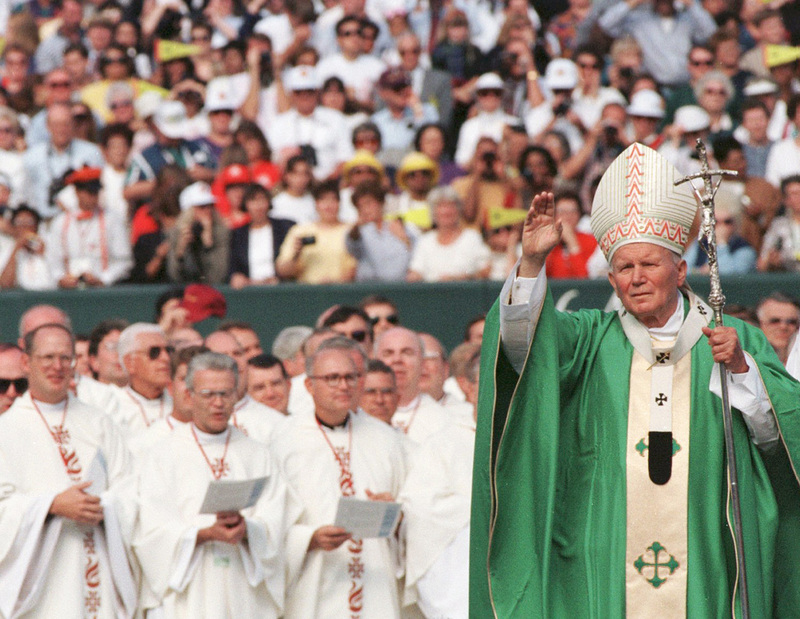 It was the same route Blessed Pope John Paul II had taken during his 1997 visit to his homeland. 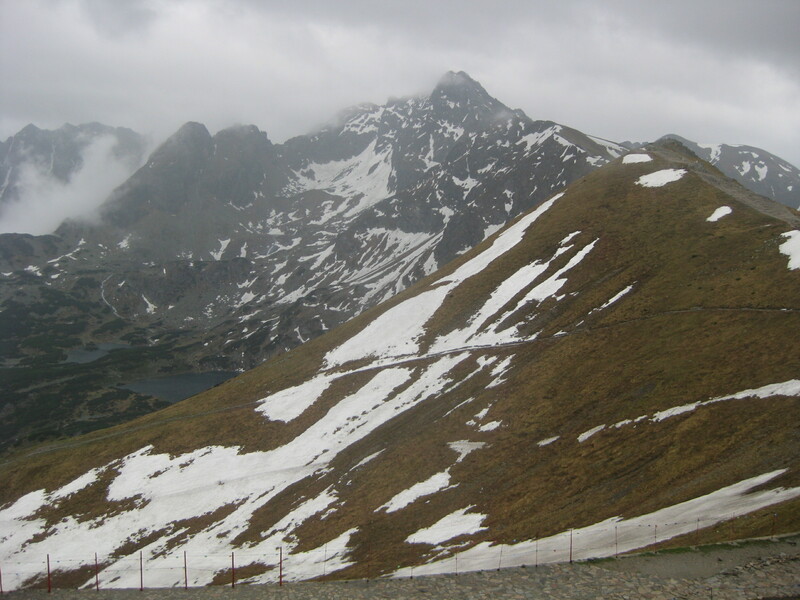 In his youth, the Polish pope often hiked and skied in the Tatras. The resort station, which attracts visitors from throughout Europe and around the world, has numerous tributes to the late pope. 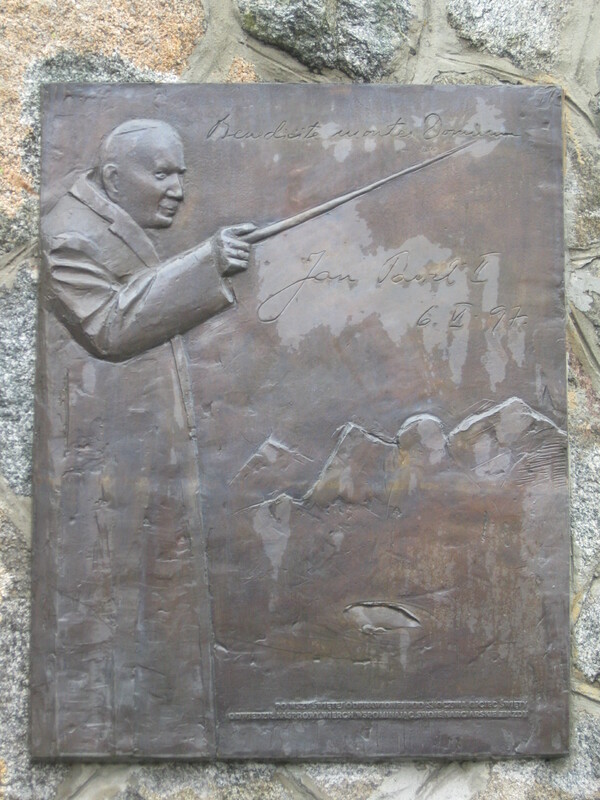 A large plaque commemorates his 1997 visit, portraying the pope pointing his cane skyward to his beloved mountains. Tomorrow morning, Bishop Mitchell T. Rozanski will lead a pilgrimage to the Czech Republic, Hungary and Poland. I’ll be reporting on the spiritual journey for The Catholic Review — both on this blog and in the print edition of the newspaper. Over the next two weeks, be sure to check The Narthex for updates, photos and video reports from Europe. I hope to provide a glimpse into the deep spirituality and strong Marian devotion in that part of the world. I also hope to gain some insights into the holy sites that shaped Blessed John Paul II, while experiencing Catholicism as it is practiced more than two decades after the collapse of Communism. They’ll be some surprises along the way, I’m sure. It’s a special honor for me to report on this particular pilgrimage. My grandparents on my father’s side were both from the Czech Republic and my grandparents on my mother’s side were both from Poland. My dad grew up speaking Czech at home, just as my mom spoke Polish. It will be a bit of a homecoming for me. Stay tuned. Much more to come. 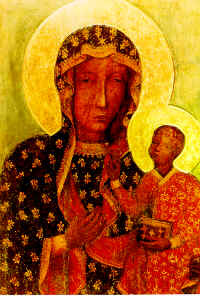 Our Lady of Częstochowa…Oroduj za nás — Pray for us. 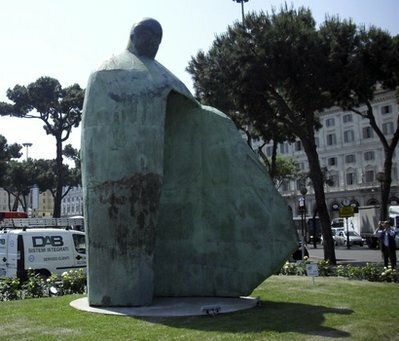 A newly installed, hulking statue of Blessed Pope John Paul II is getting big-time thumbs down in Italy. What do you think? Is it really that ugly? I haven’t seen it in person, but the AP photos seem to confirm the criticisms. A new, modernist sculpture of Pope John Paul II is turning into a monumental bust. The Vatican on Friday slammed the giant artwork outside Rome’s Termini Train Station, saying it doesn’t even resemble the late pontiff. Some Romans and tourists say the bronze statue looks more like Italy’s wartime dictator Benito Mussolini than the widely beloved pope. 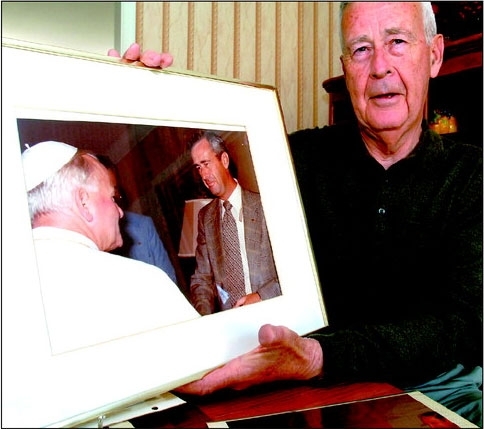 “How could they have given such a kind pope the head of a Fascist?” said 71-year-old Antonio Lamonica. Artistic intent aside, “we find ourselves in the piazza before a violent gash, like a bomb, that ends up assimilating a cloak that almost looks like a sentry box, topped by a head of a pope which comes off too roundish,” critic Sandro Barbagallo wrote in Friday’s L’Osservatore. “Altogether, the result doesn’t seem to reach the intent,” the newspaper said, noting that it wasn’t alone in its criticism.